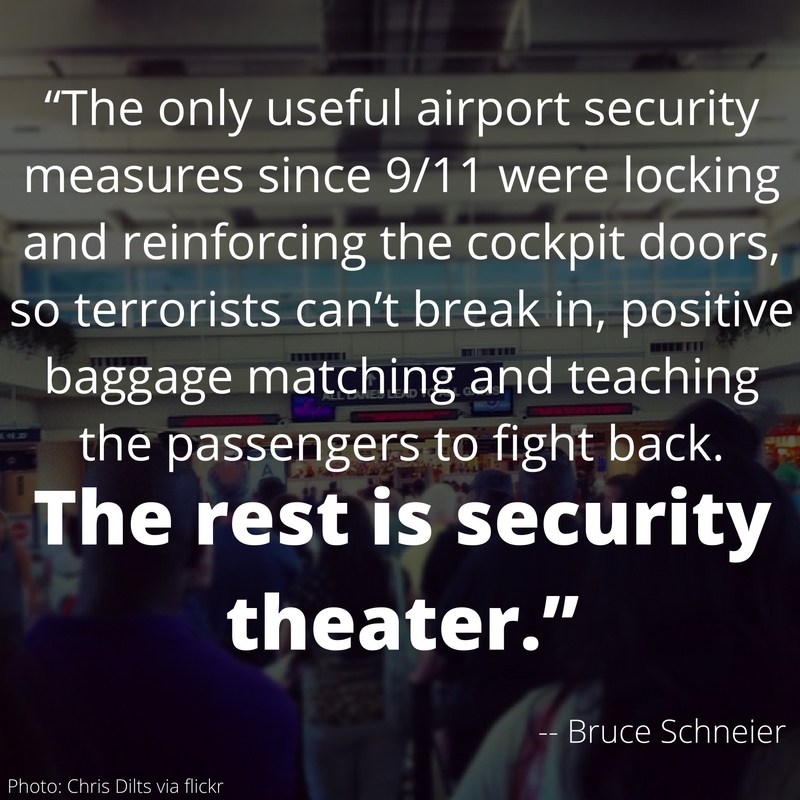 With his crushing bon mot, security-guru Bruce Schneier brilliantly described the intense screenings and arbitrary limitations on toiletries ushered in by the Transportation Security Administration (TSA) to convince the American public that something was being done to keep them safe after 9/11. In the 15 years since then, the government has overreached, spending billions on questionable technology, enacting rafts of new rules and turning flying into a far more upsetting, complicated procedure than it need be. Given TSA’s proficiency for spotting contraband water bottles and shampoo, but missing 95 percent of fake weapons undercover agents slipped past security stations, it’s no wonder that Homeland Security officials and frustrated passengers increasingly turn to TSA PreCheck and other so-called “Trusted Traveler” programs to solve their airport woes. In the past few months the number of applications for TSA PreCheck has more than doubled to nearly 16,000 people a day. Apparently the widespread proliferation of news reports tallying the number of missed flights and excruciatingly long security queues at airports works better than the actual $1.2 million TSA paid to advertising specialists to promote its “risk-based security” program. TSA Administrator Peter Neffenger testified before Congress in May that the agency now expects it to have 25 million passengers registered in the program by 2019, up from its current level of about 3 million. “One of my fundamental priorities is to dramatically expand the PreCheck population,” he told the House Homeland Security Committee. Whether it’s due to an influx of passengers or a massive shortage of trained TSA officers, airports nationwide have been overwhelmed by frustratingly long security queues. In an effort to defuse tensions, airports are sending in the clowns, literally. In San Diego, airport officials hired circus performers to entertain the grounded masses. “We certainly think [the clowns] will be at the checkpoints often, as people waiting in line are a great audience for them,” exclaimed airport spokesman Jonathan Heller. Using clowns and miniature therapy horses (like at Cincinnati/Northern Kentucky International Airport) to alleviate traveler irritation is likely to have mixed results at best, but the same should be said for TSA’s PreCheck. PreCheck lanes operate in more than 180 airports across the country. They permit members who provide DHS with detailed personal data, a photograph, and fingerprints to pass through the airport security with their shoes on and laptops stored in their carry-on bags. “With a 5 year, $85 membership, you can speed through security,” beams the TSA website. But isn’t housing photographs and personal data of men, women and children over 12 who are catching a flight to grandmas for Thanksgiving dinner in a criminal database a risky move? It’s practically begging for false-positives, data breaches and other errors. A major concern about the program is that it will generate false alarms when travelers share similar names and other personal data with individuals flagged as a risk. Critics of the program point to past mismatches, such as the 2004 revelation that airline agents tried to block then-Sen. Edward Kennedy from boarding because his name resembled an alias used by a suspected terrorist on a government watch list. According to the FBI’s website, NGI “provides the criminal justice community with the world’s largest and most efficient electronic repository of biometric and criminal history information.” But many of its files are incomplete and don’t tell an accurate or complete story. A 2015 GAO report discovered that more than 10 states reporting to NGI contained files that were 50 percent or less complete. Hundreds of thousands of job applicants each year are negatively impacted by incomplete FBI data, according to the National Employment Law Project (NELP), a workers’ employment rights advocacy organization. “Nearly half of FBI rap sheets failed to include information on the outcome of a case after an arrest—for example, whether a charge was dismissed or otherwise disposed of without a conviction, or if a record was expunged … routine omissions [which] seriously prejudice the employment prospects of an estimated 600,000 workers every year,” the group said. TSA Chief Risk Officer Kenneth Fletcher, speaking at a data analytics conference in April, said the problem of long security lines won’t be solved with more screeners. Instead, the agency should continue to pursue and develop intelligence-driven security protocols that use data analysis to identify the pool of risky passengers. This perspective fits perfectly within the TSA’s evolution in becoming a “risk-based, intelligence-driven, professional counterterrorism agency” as it claims to aspire on its website. The shift in airport security toward identifying risky passengers instead of prohibited items in your luggage is a major split with past policy. It means the government will want to know more about each passenger, to feed its secret algorithm that determines which PreCheck applicants are deemed “low-risk” enough to participate. Trusted Traveler programs like PreCheck, Global Entry and NEXUS already bar people who have certain criminal records. But will TSA seek to review data that airlines and travel agents collect on their customers, including potentially confidential details from travel itineraries like destinations and meal preferences (e.g. kosher or halal)? And what happens to people whose applications are rejected, those considered “too risky” to keep their shoes on in line? Will they be told why they didn’t qualify or have a chance for redress? A few years ago the agency proposed expanding the types of information it and its private-sector contractors would collect and review for PreCheck. TSA wanted to “collect all the commercial data, look at social media, look at things that may or may not be indicative of a threat, and then make a determination,” said Tom Bossert, former DHS official and now president of CDS Consulting. Fortunately, this effort was halted, but it’s unlikely to be the last try to broaden the program’s scope. As details emerge on how the government plan to distinguish between “trusted travelers” eligible for lighter screening and those who will receive more scrutiny, questions about the vast amounts of personal data to be reviewed, collected and stored continue to flourish. Americans are being asked to pay for the privilege of shorter wait times, but they shouldn’t be treated like criminals just to catch a flight.